The First Empire Series is Done! I was shooting for April or May and got it in under the wire in March. Well, that's not entirely true, I still have to take another pass before my alpha reader (Robin) can put eyes on it, but her birthday is April 8th and I'm shooting for that. But I've "wrapped" the series and now know how it all ends. I'm really happy with how it's come out, and I hope others will be as well. Writing an entire series before publishing any books is a lot of work, but I really think it paid off. I have a few changes to make to the first book one that came up in the last few pages! Now we just have to get the first book released - but it's Del Rey that has the remaining lifting for that book. Still, can't help but be excited about being done. I have a confession to make. I'm a complete idiot. Well, maybe that's not news to readers of this site, but I'll explain what I'm referring to in today's post. When I first hired a freelance editor to help me with my self-published books, the first question potential candidates asked me was, "What style guide do you want me to use?" My response, "Style guide? I'll do the book formatting. Why does an editor care about the style guide?" You see, I came from marketing, and in that world, a style guide lays out rules for using logos or spacing and size of fonts. Design style guides cover things like how much white space should appear between the brand mark and other elements on the page, permitted colors, and how to scale the logo elements. I didn't understand what a style guide was in relation to editing. Ever hear people debating the use of the Oxford comma? You know, that's the comma which is sometimes added or omitted before the conjunction in a list of items. For years, the AP Style Guide said omit them while the Chicago Manual of Style said to include them. For novels, most editors will use the Chicago Manual of Style, sometimes abbreviated as CMoS. It's a massive volume. The 15th edition comes in at 984 pages, and the 16th edition topped the thousand-page mark by coming in at 1,024 pages. It's also not all that cheap. List price for the print edition is $65.00 (although Amazon has it discounted to $40 and change). But it's not the price that bothers me about CMoS. The issue is it can take a long time for me to find what I'm after, especially if I don't know exactly what I'm looking for. For instance, when writing my first published novel, I was debating which was correct: "your majesty" or "Your Majesty." It could take me a lot of time to find the answer in the printed version. It's in section 8.32, which explains how to capitalize honorifics, by the way. And hence today's post. There is an online version! 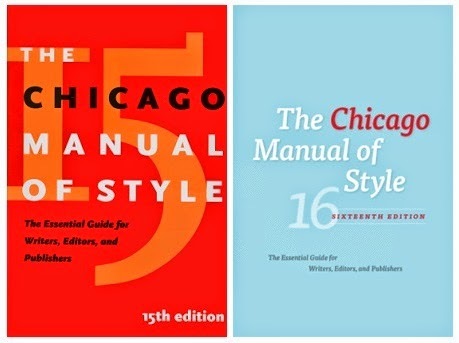 If you go to this link, you'll find both the 15th edition and the 16th edition of the Chicago Manual of Style in all its searchable glory. And yes, they offer a free trial month so you can see for yourself if it is something worth spending money on. If you do want to have it long term, then the cost is just $35 a year ($30 per year if you sign up for two years). Yes, that's just slightly cheaper than the book, but the time you'll save is well worth it. 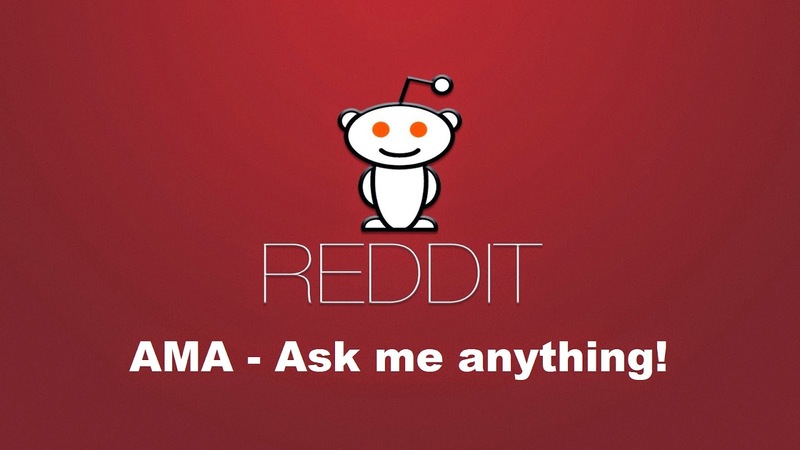 I love AMA's, and I'm doing another one today! If you aren't familiar with the concept, it stands for "Ask Me Anything" and while they occur all over reddit, the mods at /r/Fantasy do an amazing job organizing them. The success of the Riyria Revelations books. 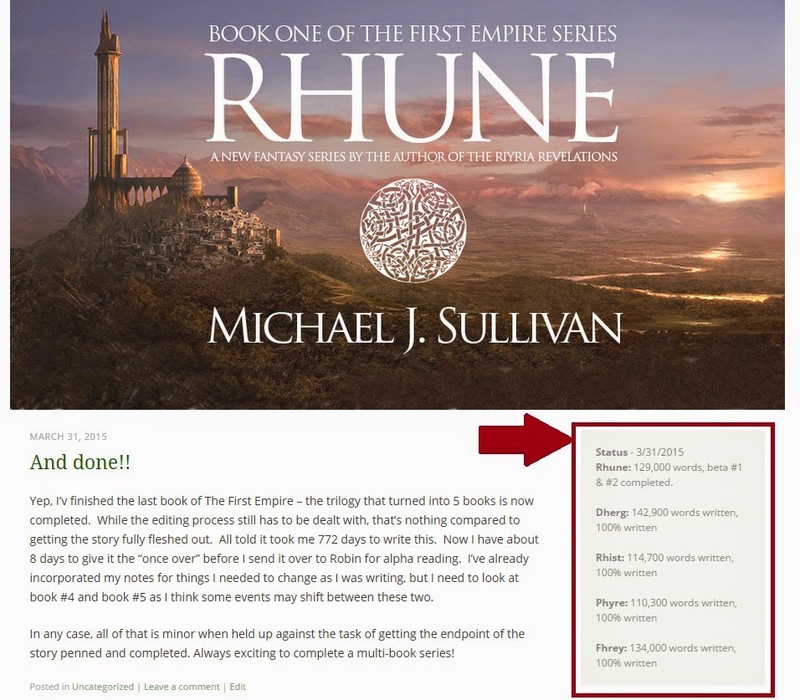 Why I did the prequel series, The Riyria Chronicles? Why I'm writing science fiction, and what's different about Hollow World? Why I signed my new series with Random House? What is the new series about, and when will it come out? How has publishing changed, and is continuing to change, and what does that mean for writers? I do hope people will stop by and ask a question or just say hello. Anyone who does post will be entered to win one of the limited edition early, early advanced copies of Rhune. Only a handful of people will have this opportunity (basically the beta readers and a few winners). Everyone else will have to wait until the summer of 2016. So that is reason enough to stop by. Here's the link. Yes, it is always that clean. I abhor mess, especially where I work so if I bring out a book or something for reference, I use it and put it back (what this picture doesn't show is the bookcases on the wall behind me. Yes, the clocks don't match. I love the look of the wall-clock (given to me as a gift) so I display it proudly on the wall...but it "ticks" loudly and when I write I want complete silence. The dagger is my "Stabby" from reddit's Fantasy sub. It's an engraved award given out at the end of year. Mine was a community achievement award for best overall redditor. The coffee mug is always by my side. I'm fueled by coffee, especially since I do most of my writing in the morning. My computer is a Mac - which I love dearly. It's clean and beautifully designed. The fact I have no wires for my keyboard and touchpad (preferred over mouse) is something I appreciate to no end. Robin accuses me of loving my Mac more than her...that's not true, but I must confess I spend more time with the Mac then with her....hmmmm. The microphone and earphones are used for podcasting. I also sometimes use earphones...for instance if Robin is on the phone, as any noise is distracting. The lamp on the left is new - a big splurge from a recent royalty check. My feet are up on the bedpost - yes, my office is in my bedroom - REALLY short commute. Robin is in the process of getting me a "writing cabana" - a separate building where I can isolate myself. The building is actually "done" and will be delivered to some land we bought in the mountains as soon as the ground has dried out and can accept a truck with a heavy payload. I have a local writing critique group that I don't go to very often. It occurs on the same night that I head out to the pub, and sometimes authors I'm friends with come meet me at the bar before or after. When someone I know has a piece up for critique, I do go and help them out with my feedback (most of which I share privately because I'm a very picky reader). My goal in critiquing is to help the author be better, not to stroke their ego and I'm a harsh critical reader. At a few meetings I've come across some submissions by Thierry Sagnier. I don't really know him, but his work was always well received by the group. One thing led to another and we (my wife and I) ended up meeting him for lunch to talk about various things. Robin has a way of volunteering me for things, and I knew after a short while she was going to ask me to "whip up a cover." Luckily, I had already read the book and really enjoyed it, providing a bit of help on restructuring of the start. For her part, Robin volunteered to do the book's layout and create a new ebook file (formatting in the old version was jacked up for reasons none of us understood). She also was willing to help him get the book posted on various sites and making the paperback available for sale. Thierry hired a copy editor to go through the book from top to bottom and it has now been released and is live on goodreads and Amazon. A fortune in drugs is missing. Finding them starts with finding her. Now the Zulu wants his drugs, Mamadou wants revenge, Joe just wants to do his job for once, and Colin wants to save his girlfriend’s daughter. All Josie wants is to remember what Herbie might have told her, what the Zulu insists she knows. If she doesn’t—she’s dead too. Mollie? She wants it all. Behind the polished marble of Washington DC, lies dark alleys where everyone thirsts for something. 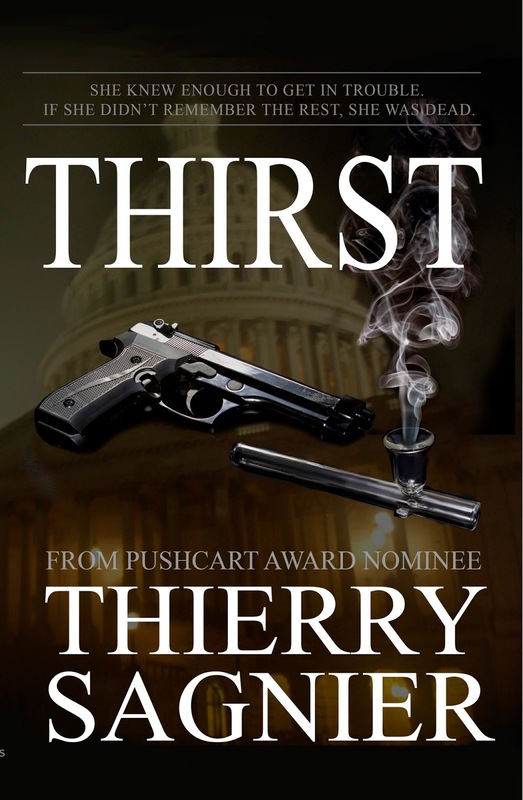 So if you happen to read suspense thrillers, please take a look at the sample of Thirst or check out Theirry's goodreads page and it to your "to be read pile." If you do give the book a try, please let me know what you think. Sorry, I missed this post last week. Things got pretty crazy here, and I couldn't get it written in time. I'm trying to use Saturdays for Tools for Authors. And previously spoke about Natural Reader. Today I want to talk about Grammarly. Grammarly is the world's leading writing enhancement app. It checks for more than 250 types of spelling, grammar, and punctuation errors, enhances vocabulary usage, and suggests citations. Widely used, they have more than 4 million registered users, including myself. Here's an example of Grammarly in action. One of the features I find particularly nice is that you can classify they "type" of the writing. In other words, something more formal (like a research paper) will have slightly different analysis criteria than say a creative writing piece like a novel. Now it should go without saying that Grammarly is not a replacement for a good editor, but it does do a good job pointing out some common problems and alerting you to something that might be an issue. The little "x" on the right can be used to ignore something that you know is correct. If you are not sure what it's trying to say, then the down arrow will give you more information. Grammarly also has a Handbook, which you can use to learn the rules of grammar with topics such as how to use commas or hyphens. I've found Grammarly to be well worth the money. Check it out, and maybe you'll agree. 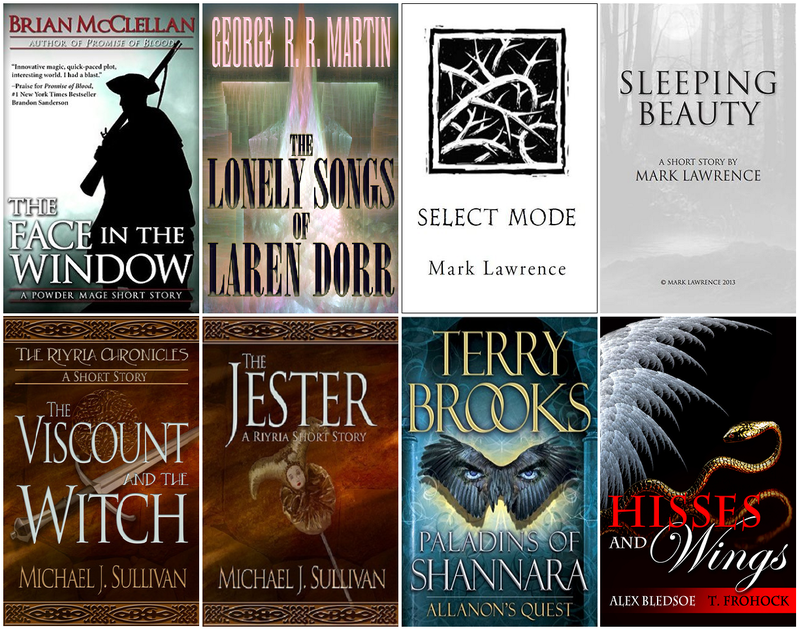 The GrimDark Alliance posted a list of Eight Great Short Stories under $0.99. And I thought I would share it. Here is a link. 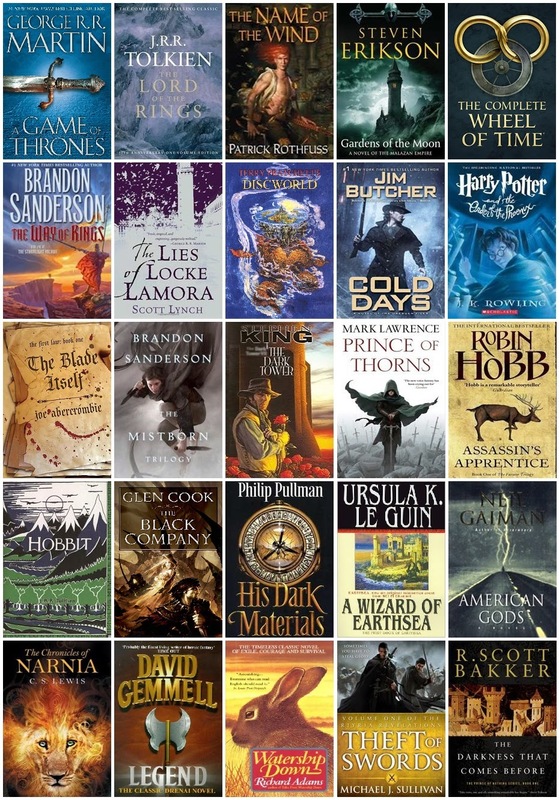 In 2014 /r/fantasy had more than 50,000 members and p0x0rz created a poll resulting in "the big list" to find the top series recommended by members of the board. When all the voting was in (511 votes) a list of 105 series were compiled. For 2015 there were more than 73,000 members and the "voting list" was determining authors rather than series. The results aren't yet in (the thread has more than 800 posts), but you can see the votes here. There is another poll going on related to series. You can vote for it here. Every year is the same. 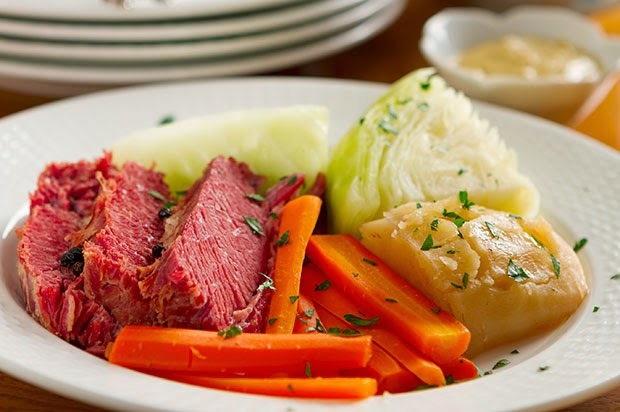 St. Pattys means I'm going to whip up my FAMOUS mustard creme sauce and laddle it over a big plate of corned beef, cabbage, and boiled potatoes. Robin and I look forward to this meal all year long, and even tried having it on non March 17th days as well. The problem is it's the sure-fired way for our kids to scatter. How can the fruit of my loins turn their backs on a timed-honored Irish tradition? Sacrilege! A lot of authors hang out there and are very open to interactions. A fabulous set of moderators that keep the group growing by leaps and bounds by fostering an incredibly friendly and respectful online presence. Really great contributing members who have great posts and comments. As is the nature of such forums, a lot of names come up time and time again in recommendations: Patrick Rothfuss, Brandom Sanderson, Joe Abercrombie, even myself - for which I'm very grateful. But there are a ton of quality authors that just don't get the mentions that they should. From time to time some of the members hold polls and I thought one of the best was a poll to highlight those authors that aren't often mentioned, but should be. Running these polls can take a lot of work and I'm grateful for p0x0rz for putting it together. You can find the full list here. But I'm reproducing it here sorted alphabetically by author's first name. So, if you find yourself looking for something new, I suggest you check out some of these books. You just might find your next favorite read. Dread Empire | Garrett P.I. Well, that's not entirely true, I always have questions because I'm a curious guy. But my queue for the Goodreads "Ask the Author" has run dry. To date I've answered more than 100 questions (108 to be precise), and it's one of my favorite things to do. So, if you have questions about me, my writing, or publishing, please toss me a question. You can do so at this link. Or ask one here, and I'll post it on your behalf. That's a tagline I've recently come up with to concisely explain my new First Empire series to existing Riyria readers. For those who have read those books, I "might" have been "less than truthful" about certain events in Elan's past. Specifically, the legend of Novron/Nyphron and how he saved mankind from extinction and formed the First Empire. While there is no Royce, Hadrian, Arista, or Esrahaddon, there will be some familiar names including Nyphron, his beloved Persephone, and Mawyndulë. Don't remember these people, or how they fit into Elan's past? No worries, you'll figure it out as reading, and besides, this series is designed to be read by those who haven't read any of the prior Riyria books. That being said, I do like to reward loyal readers, so for those who HAVE read Revelations, you'll get the added benefit of seeing the events in a whole new light. After all, they say, "History is written by the victorious," and I think that is very true. Exposing the truths that only I know about is part of what has made writing these books so enjoyable for me. As to how the project is going...it's doing quite well. I'm about a month ahead of schedule with regards to finishing the last book. The first book has had two solid beta reads, and the additional changes to it are minor. Robin has a nicely prioritized list, so that should go quickly. And she is going to New York to meet with some of the people at Del Rey to discuss "business." I can't begin to express how helpful that last part is to me. Just "thinking" about the business side of writing saps me of all creativity and puts me on edge. Not being involved makes me blissfully oblivious and keeps the words flowing, which is good for everyone involved. On other fronts, I've been using my "afternoon downtime" to work on the plot for the third Riyria Chronicle. It's starting to take shape, and I'm looking forward to diving into it. Given who long I've been in Elan's distant past, it will be nice seeing old friends again. Well, if you snooze you loose, and so this event is already closed, but I think it is worth talking about anyway. Mark sent me an email about this last Sunday, but I already had an "Authors Helping Authors" post for that day, and when I went to write this post, it had already closed. Doh! Asked the bloggers to act as "agents" in that they wouldn't read all the books but would pick one to move to the "next round." After six months, the bloggers (who are free to review any books they were assigned) deliver their verdict. You can read all about the "process" in Mark's post here. So, why still post about this if the event is closed? Well, a few reasons. First, I want to give a shout out to Mark and all the bloggers for their generosity of spirit. I believe what goes around comes around and hopefully you, fine readers, will support Mark by buying one of his amazing books (See a list of them here). As to the bloggers, they are all excellent and if you are a fantasy fan and not already following them, please do. I'm sure if you check out their reviews and interviews, you'll find some great new books to explore. The other reason why I'm posting this, as I'd like to follow this process as it goes along. I'm always looking for new indie authors to read, so I'm excited to see what is recommended. I'll keep you posted. Like my Sunday "Authors Helping Authors" post, I'd like to try to use Saturdays to focus on tools for authors. Today I'd like to talk about NaturalReader. You've probably heard that when proofing your book it's best to read it aloud. I think this is excellent advice. In the "old days," Robin and I would do the proofing of my books by taking turns reading aloud to one another. Why did we do it as a team? Well, because we often don't read what's on the page, we read what we "think" is on the page, which means we insert missing words or remove duplicated ones. Having both of us would usually catch the error because one person was following along and seeing where the other "auto-corrected." When my wife got her first Kindle, it had text-to-speech built into the device. Then Robin started doing the proofing herself because the computerized voice doesn't skip or "auto add" words. It says EXACTLY what is on the page, and she can find those errors quickly and easily. Robin's Kindle is battered and beaten, and the headphone jacks no longer work. Plus, she can't plug her Kindle into the car radio and listen to the book while driving. Another solution was needed. Enter NaturalReader. "NaturalReader is a Text to Speech software with natural sounding voices. This easy to use software can convert any written text such as MS Word, Webpage, PDF files, and Emails into spoken words. NaturalReader can also convert any written text into audio files such as MP3 or WAV for your CD player or iPod." Now Robin imports the book's doc file, converts them to .mp3 files, and puts them onto her iphone so she has them wherever she is and can even listen while driving. 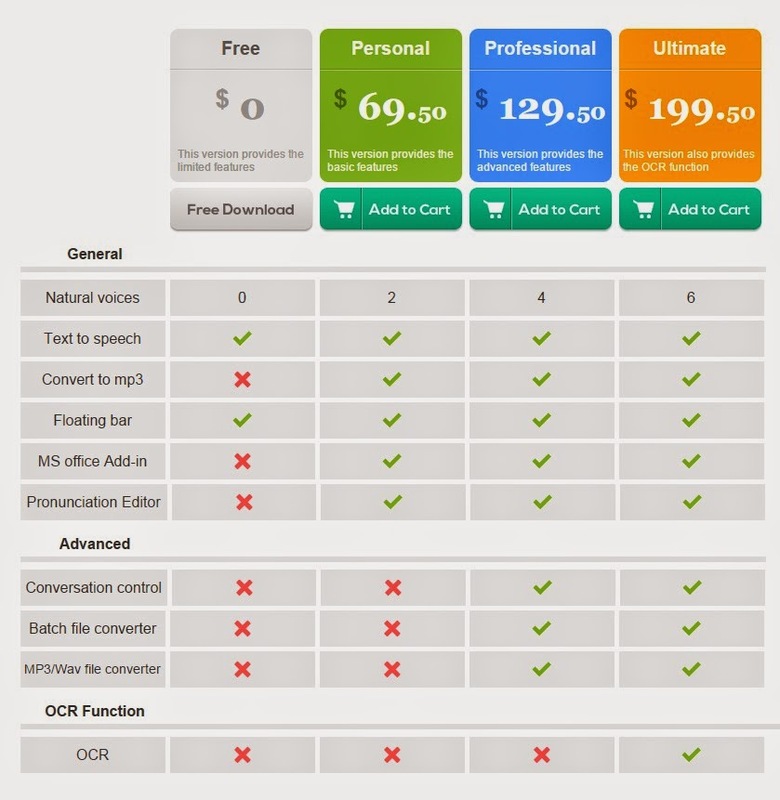 Natural Reader has a few different pricing levels, including free. We use the "Personal Edition" and it has worked very well for us. The great thing about Natural Reader is you can choose from a number of voices, which sound much more realistic than the standard "Steven Hawking" version used by most text-to-speech software. Plus the ability to turn them into mp3 means we can listen to them from virtually any device. Given its low cost, I think it's well worth the investment. Give the free copy a try, and if it works out for you think of upgrading. I'm sure you'll find it pays for itself in the mistakes it finds. But I'll definitely be on the look out for more. If you haven't seen the episodes produced from this yet, I HIGHLY recommend you do. 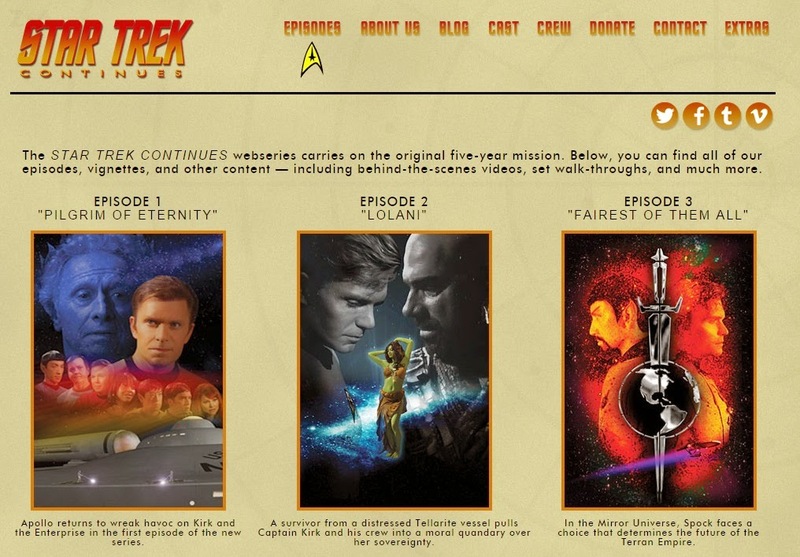 They are exceptionally well done and very nostalgic. Oh, and after checking it out, if you like what you see as much as I do, then donate such awesomeness is worth paying for. I did! 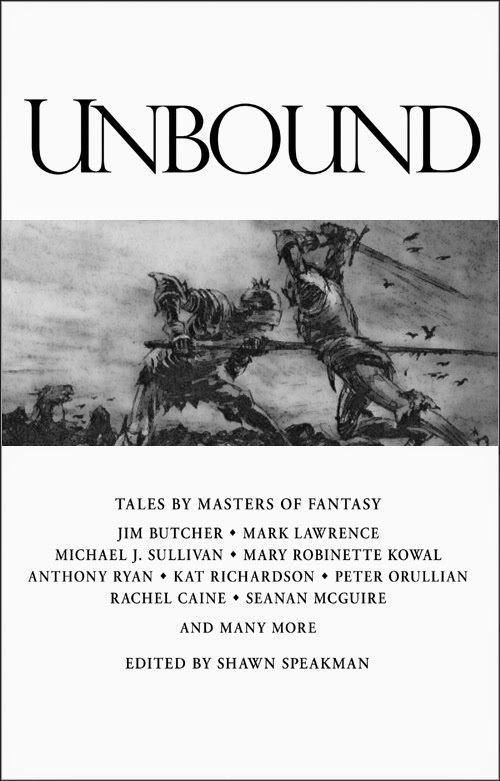 Unbound Anthology Line-up and Pre-ordering! Did you love Unfettered? Or were you bummed because you missed out on the signed and numbered copies? Well, don't fret, here comes Unbound and pre-ordering is up now! Like Unfettered, this is expected to be one of the most anticipated anthologies of this year, so ensure your copy now by pre-ordering! Now for the record, I've not yet read any of Kameron's books...although I've bought all four of them to support her. So, why am I recommending her work and asking you to "check it out"? Nominated: BSFA Award for Best Novel. She also has short stories curated by some of the biggest magazines in genre fiction including Lightspeed, EscapePod, and Strange Horizons. All that tells me she's an amazing writer that really cares about her craft. But, that's not the reason I'm singling her out for one of my Authors Helping Author's Post. No, my reason is simple...she's doing everything right, and yet still struggling. Kameron is no stranger to self-promotion, and has launched monumental efforts each time her books release. Plus, she is writing and releasing frequently. She reminds me a lot of Robin who took a "failure is not an option" attitude when starting my own career. I have no doubt Kameron will be more well known in the future, and anything I can do to help get the word out about her I'm happy to. I'm not one to say "BUY THIS BOOK" but I do want to let people know Kameron and work exists. Go checkout some sample chapters. Read her blog. And if it looks like something you might be interested in, then by all means plunk down some money. This business isn't easy, but when someone like Kameron is doing it all right, that's worth supporting. I hope you find one of her books right up your alley.